A while back, I saw a picture of some luscious looking cream cheese cookies at dessert comes first. Shortly thereafter, I received an e-mail request for cheesecake cookies. I knew I had to try. Cream cheese in used in many cookie recipes to enrich and soften a butter dough, but the flavor is subtle and often blends in with the butter. If you are told that there is cream cheese in the dough, you might taste it, but otherwise it is not an obvious flavor. This was the biggest challenge to overcome, since too much butter would overwhelm the cream cheese. I settled for an equal amount of butter and cream cheese. I needed enough flour to give the cookies a nice, stable texture and used an egg to bind everything together. I have experimented a bit and this is the best version I have come up with so far. 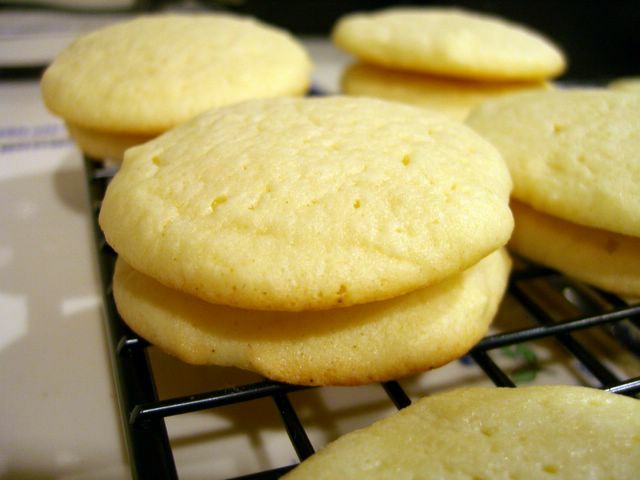 They are soft, chewy and definately remind me of cheesecake, though perhaps cheesecake crossed with a sugar cookie. I did not include any vanilla because I didn’t want to mask the relatively delicate flavors, though a little bit surely wouldn’t hurt. Don’t over bake them or they will firm up and loose that soft cheesecakey texture. These cookies keep very well, so you can store them in an airtight container for several days. In a large bowl, beat together butter and cream cheese. Gradually beat in sugar at medium speed until light and fluffy. Beat in egg and salt. Whisk together baking powder and flour in a small bowl and, mixing by hand or at low speed, add to cream cheese mixture. Drop by rounded tablespoonfuls onto prepared baking sheet. Bake at 350 for 12-14 minutes, until the bottom edge just barely turns brown. I wish I could reach in and grab one of these. I bet some lemon or lime juice and zest would be good in these too. they are simple, but so pretty! a good break from the usual cheesecake and to use up the cheese! thanks! Yes , a little lemon zest . They sound delicious . What a great idea! Sugar cookies and cheesecake, it doesn’t get much better. I wonder if you could make them in a more italian style, with ricotta cheese. I’ll have to experiment with that. These sound wonderful. I think a touch of genuine strawberry extract would be wonderful. Then you could call the strawberry cheesecake cookies. Nice idea! I do admire your devotion to baking so often. Hey there, I tag you for the Seven Meme! Hi Nic! I’m a fairly recent visitor to your site and I must say, your recipe collection is the best I’ve come across so far! I just tried your cheesecake cookies and they came out FABULOUS. I have a penchant for sweetness so I rolled the cookies in extra sugar before dropping them onto the baking sheet. They came out perfect; chewy, sweet, with a cheesecake-like flavor. I also tried your chocolate cupcakes w/ peanut butter creme recipe for a friend’s birthday and she went gaga over them. These were sooo good. My husband and kids loved them too, they didn’t even last 24hours, and I doubled the recipe. Thanks. I tried this recipe yesterday right after work. I cut down on sugar and divided it into 3; one batch I added lemon juice, one original and the other, strawberry paste. The cookies spread quite a bit (or prolly coz I’ve added too much baking powder). Turned out great! Loved it with lemon. These cookies are nice and easy to make…but they are tooo sweet. I added 3/4 of the amount of sugar the recipe called for, and it still ends up so sweet that the cheese taste got covered up slightly. I tried these yesterday and had to make them again today, because my husband ate them all! I, too, double the recipe, but I also add extra cream cheese (1 1/2 cups in the double batch). Now if I could incorporate Nutella, I’d be in heaven! hey. the cookies were seriously yummy and great, although i reduced the sugar to 3/5 cup of sugar!! Those look beautiful; I can’t wait to try them. I think I’m gonna pair them up with a thin layer of raspberry jam between them to make sandwich cookies. Just made these for the first time last night and must say they turned out great! They are so soft and chewy with right amount of sweetness and cream cheese flavor (although I did add a bit more cream cheese). I’m definitely making these again for Christmas as I’m sure the batch I made last night won’t last til then! These cookies are sooo good!…I had to make another batch because everyone was eating them as I took them out of the oven. Thanks for a great recipe! Maybe a silly question – but is 1/2 cup of cream cheese the same as half of an 8 oz. brick? I know 4 oz. of butter is 1/2 a cup, but not sure if the measurements are the same. Thank you! I am going to make these tomorrow for a luncheon I am hosting on Saturday. I made a double batch of these this past weekend. They were a little plain on their own (although still tasty), so I took someone else’s idea and sandwiched them together with either raspberry or apricot jam. They were delicious and looked very cute. I would definitely make them again. i made these in a bid to escape from studying and they were terrific! i reduced the sugar and added white chocolate chips so they were heavenly warm from the oven, thanks! These cookies are the best. Once again you have come through with an awesome recipe. I made these cookies today, they are fast and easy to make and just wonderful. Light, fluffy, cheesecaky. I may have to make a second batch for any one else to have some. My family loves them and they’re so quick and easy – a new favourite recipe! I’ve made 2 batches of these and got RAVE reviews both times.. i took them to my cousin’s office and they seriously disappeared. i had 4 people ask me for the recipe. thank you so much for always sharing the most amazing creations. LOVE your site! i’m going to try someones suggestion and add graham crackers next time i make these.. YUM. I was thinking of sandwiching these between a layer of chocolate or jam, but I got lazy and brought them to work as is. People went crazy. They keep really well, but you don’t need to worry too much about that, because they disappear so fast!